New IHG PointBreaks list launching today – probably! IHG Rewards Club will be releasing a new PointBreaks list on Monday – I think. I say ‘think’ because IHG has not been trailing this on social media as it often does, and the ‘Cyber Monday’ hype will overshadow it somewhat. However, assuming it happens, participating hotels will be bookable from Monday afternoon UK time. It seems at the moment that we won’t see the list until it is officially published. I would expect to do an extra post on Monday evening if I have the time. If you are on our email list you will have to wait until Tuesday morning or pop onto the site on Monday evening. The 100+ PointBreaks hotels on the list will be bookable for the period 1st December to, probably, 31st January. The cost will be reduced to between 5,000 and 15,000 points per night depending on hotel. There is no teaser list this time so I can’t give you any examples of what hotels will be included. Let’s see what happens. At 22.35 last night, the arrival of the British Airways flight from Larnaca marked the final commercial Boeing 767 flight for the airline. Both remaining aircraft are due to fly out of Heathrow on Monday to the BA maintenance facility in Wales – I’m not sure what will become of them but it seems unlikely they will fly again. There were originally 11 aircraft in the fleet, with the first arriving in 1989. At one point the fleet grew to 28 although many ended up being leased to other airlines. 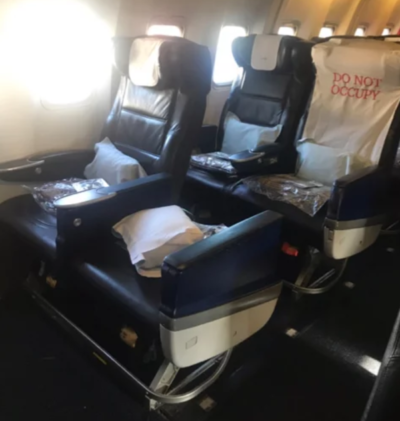 I was thinking of putting together an article on the British Airways 767 fleet but it turns out that it has already been done, far better than I could have done it, in this blog article by a BA pilot. I strongly recommend you read it if you’re interested in this sort of thing. In truth, it is being polite to say that the British Airways fleet had seen better days. The regular random pinging of call bells was a common complaint, something which gets annoying on a four hour flight, as were complaints over water leakage from the galley running down the cabin. And the broken seats. And arm rests. And tray tables. And the locked-out loos …. Half of seat 2J has just vanished. The delights of Club Europe …. Is easyJet Plus worth the annual membership fee? That’s great news, thanks very much. OT – Does anyone think we will see any new Amex Plat UK benefits within the next year? I wouldn’t be holding out much hope! OT. The voucher to access a Lufthansa airport lounge with the new M&M card – haven’t yet received – is it for one person only? PS. Hope Amex don’t realise you’ve defected! Always felt like … a sort of novelty to fly the 767 between Edinburgh and London (getting to ‘turn left’ for CE). But Edinburgh seriously needs to figure out their ground support, so given the 767 was always on a remote stand, it added a good 45mins – 1 hour to the whole process.